Monday’s bad reputation is the result of years of propaganda and bad press. What will I make today? What will I do that will make a difference on this blank open day? How can I do something today that will make tomorrow, next week, next month and/or next year better? How can I be amazing? your mid-afternoon slump scrolling through cat gifs on buzzfeed – I mean studying award winning work on Ads of theWorld. 2. Make a Monday Playlist. Try sorting your iTunes by “most played” and make a playlist of those songs. Make the soundtrack to your day a happy one. 3. Give Yourself a Break. Make yourself do 1.5 hours of work and then take a 15 minute break to Facebook, respond to texts, chat with coworkers and eff around in general. Repeat until EOD. 4. Do Something For You. Focus on one of your personal projects and make some progress there. Put in some time doing something you are passionate about. 5. Have a mid-afternoon pick-me-up. Get a coffee. Give yourself the treat you set aside for yourself on Friday (as I mentioned here.) Go outside. Go window shopping. Whatever you do, get away from your computer screen for 10-15 minutes. It’s good for your eyes and your brain. Bonus: Get Over Yourself. Seriously. How can every Monday be the worst? 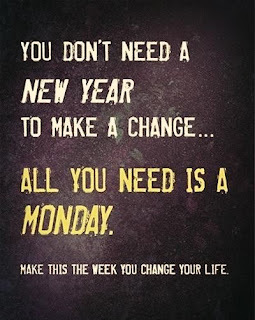 Monday is going to come and you’re going to have to go to work so just accept it and focus on how to make it better. Monday is as great as you are. If there is absolutely nothing you can do to make your day better, consider seeing a therapist or getting a new job. Tuesday, on the other hand, is as useless as turning 23. I'm not a fan. This Onion article addresses the Tuesday issue perfectly - It's Only Tuesday.